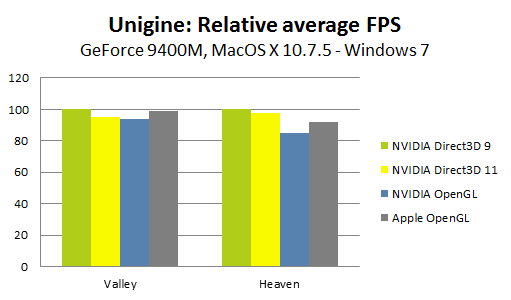 Following the post "A look at OpenGL and Direct3D performance with Unigine", here is some extra data using Unigine Heaven and Valley on Mac running both MacOS X and Windows. 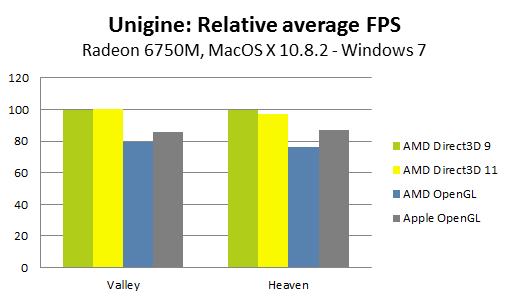 We see on these resulats that MacOS X OpenGL implementation provides better performance than AMD and NVIDIA OpenGL implementations on Windows. However, once using Direct3D, the engine run better on Windows. Interestingly, the Direct3D 9 renderer is slightly faster than the Direct3D 11 renderer on these platforms. Thanks to Vladimir Hrincar and Norbert Nopper who ran the tests for these results!